The Best Exotic Marigold Hotel is initially a strange mishmash of ideas that you rarely hear, especially during the start of the summer movie season. Take a bunch of elderly people from different vocations and walks of life, send them off to a foreign country and mix in some foreign drama and there – you have the framework pretty much for your film. Although it may seem directed more at the older crowd with it’s cast and ideas, the film is made for everyone in mind. In the end, it’s more about what it has to offer as a film that makes or breaks the strange concept together. Even though in the end, it never escapes it’s conventional plot trappings and some loose narrative points, the characters, cast and cinematography prevail as something worth watching for those willing to give it a try. The Best Exotic Marigold Hotel follows a host of characters from around England that travel to India. 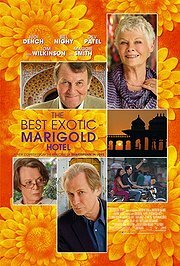 This eccentric set of characters include: Evelyn (Judi Dench), Grahm (Tom Wilkinson), Douglas (Bill Nighly), Jean (Penelope Wilton), Muriel (Maggie Smith), Norman (Ronald Pickup), and Madge (Celia Imrie) who end up meeting in a rundown hotel in India run by Sonny (Dev Patel) who is trying to sustain his father’s dream business. All of the visitors are surprised to learn that the hotel may not be what it initially seems and slowly uncover each others’ true motivation for going away from their home country. The film’s largest hurdle is in it’s own genre conventions and narrative weaknesses. Director Madden is known for various works, but Marigold Hotel feels closest to Shakespeare in Love for it’s romantic and dramatic elements. However, the problem in this film is in how much of these elements it chooses to try and explore, especially with such a large cast. The eventual conclusion is that while some of the stories do work in the film’s favor, the other half feels inconsequential and unimportant. Perhaps that fault is to be expected with trying to give each set of characters some equal amount of screentime, but the bigger issue is that even the better storylines are mucked up by an overly melodramatic and corny narrative arc. In one sense, it feels a bit interesting since one rarely sees such filmmakers try to bring such elements with an older cast but the effects are just the same with the same predictable endings and roll over to even the younger cast with Patel’s side-story taking a similar hit. Especially in the film’s second half, Madden feels like he becomes too reliant on these features and not only is there a lack of surprise, but seasoned filmgoers will most likely roll their eyes at the plot proceedings. However, there is something to still be said about the film’s energy and fascinating insights that push it to be a film that is worth at least a watch. One point worth mentioning is in the cinematography combined with the music and editing. Madden and his cinematography team bring a hurried proceeding, especially in the first half, to the film with some quick pacing and some slick camerawork. The busy streets of India are reflected in the imagery as the camera sways back and forth, moves quickly along, and bustles with the crowd of people with appropriate wide shots and the visitors’ perplexed look. This energy gives some of the even weaker moments of the plot some energy and gusto that would otherwise feel boring and trivial. A second fascinating point comes from the undeniably talented cast. Even though half of them are given unnecessary plot points, with the little they are given to work with, there is a certain amount of charm and wit that still carry through. And finally, there is some interesting insight that comes through with the other half of the characters on both their own inner demons and insights about life. Dench and Wilkinson each carry plotlines that are the most fascinating to listen to and their dialogue is given the most amount of thought and breadth, which audiences will have to go watch for themselves. The Best Exotic Marigold Hotel is filled high with melodrama and corny narrative, but some great insights and interesting characters pull the film through to being worth a watch. Expect to roll your eyes and easily point out how the narrative arc will end up as the film does little to mask, especially by it’s weak latter half, the ultimate conclusion. However, there is both an energy and charm that makes parts of the film work to eventually sway your opinion to it’s side due to the strong cast, interesting characters and energetic cinematography. Although older audiences will appreciate the cast more than younger generations, both young and old can enjoy the better parts of the film – come for the cultural perspective and cast – stay for the characters and insights.